Streets are under water in Mora. Marc Johnson snapped this photo of flooded streets in Mora. 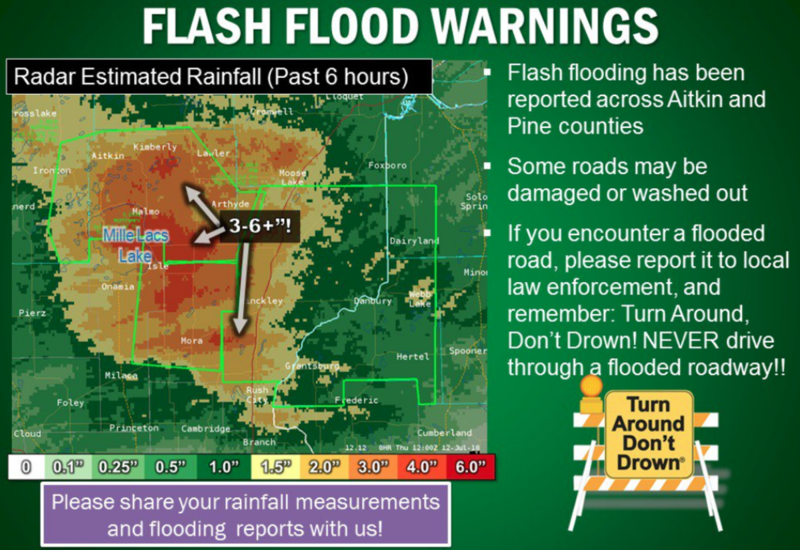 Another round of torrential rainfall has caused flash flooding in many areas of east-central Minnesota, with flash flood warnings in effect for Pine County, Aitkin County, Crow Wing County, Kanabec County and Mille Lacs County. According to the National Weather Service, 4-7 inches of rain fell in a matter of three hours overnight, flooding several roads in Mora and stranding vehicles. The airport in Mora measured 5.65 inches of rain in a three-hour period from 4:30 a.m. to 7:30 a.m. Many of these same areas were hit by torrential rains and flash flooding just weeks ago, so the already saturated ground is having a difficult time draining the water. Fortunately, the airbag and seat belt saved him. Tuesday is setting up to be a wild day in weather. 8 or more inches of rain could fall in some locations. He was a longtime host and announcer in Des Moines. Upwards of 3-5 inches of rain, maybe more, could fall. A strong tornado cannot be ruled out, forecasters say. Storms dumped as much as 6 inches of rain in places on Saturday.